Laughter is the best medicine, but managing these mini people is no joke. Deadly diseases haven't been this much fun since that cute little monkey in the movie Outbreak. 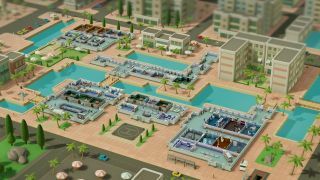 The more you see of Theme Hospital's spiritual successor Two Point Hospital, the more you crave its particular mix of the comically absurd and the fiendishly satisfying. My latest hands-on featured the first four levels of the game's campaign, and gave me a sense of how the difficulty can ramp up from 'maybe I should have been the United States Secretary of Health' to 'where's the option to buy a morgue'? The first level of the medical simulation, set in the town of Hogsport, eases you in. Not too many weird diseases, plenty of cash and time to worry about the feng shui of your reception desk. Sure, some people might die, but it’s nothing that hiring yourself a janitor with a ghostbusting skill—because in Two Point Hospital the dead tend to linger, scaring other patients—can’t keep under control. To pass each level and progress on to the next hospital you only need one star, but perfectionists can push for the big three. In an act of generosity, once you’ve left a level you can always go back, so you don’t have to go to your grave stressing about how you didn’t quite manage a full score for Lower Bullocks. There’s also regular award ceremonies, rewarding you with cash for being the ‘Rising Star’ or not killing anyone. Each of the four levels peels back another layer of Two Point’s onion of complexity, so the next stop, Lower Bullocks, is a village afflicted with a delusional disorder that leads people to think they’re rock stars. Now, while you're dealing with diseases like Lightheadedness or patients with saucepans for heads (requiring treatment in a Pan’s Lab), you need to build up a robust team of psychiatrists. Not all doctors have that qualification, so there are soon queues, angry patients, and you’re stretching finances to buy more buildings for your growing disaster hospital. It’s a tough lesson in human resources, albeit one featuring people people with light bulbs for heads. As well as the standard in-game currency for hiring staff, buying buildings and getting paid, there’s a second called kudosh that you can earn for completing different challenges. This is basically fun money that you can spend on things like fancy paintings and cosmetic items (like a skeleton model) and useful furnishings like a Sega arcade machine to keep patients entertained or a salty snack machine to keep them fed. Unlocking each new item is satisfying, and I was watching my kudosh more closely than my actual hospital finances. Which probably explains all the deaths. The next stop on my medical odyssey was Flottering, which was a learning experience for me and my cabal of odd little doctors. Here staffing is an issue, so after hitting certain staff happiness targets to get a training license, I had to invest in people instead of amusing posters for the toilet walls. That’s when it all started to go a bit wrong. Training staff takes time, and when doctors and nurses are busy book learning they’re not healing patients or—this is based on the US healthcare system after all—making money. It’s a balancing act that’s a bit harder to manage than making sure your toilets are perfectly aligned. I soon ended up with a classroom of staff, enraged Freudian Lips patients wandering the halls, a bottleneck of people trapped by the newsagent stand and—god help us all—a monobrow infestation. These little critters roam the hospital, hiding under vending machines and benches, and have to be found and eliminated. Pleasingly, when you find one the cursor turns into crosshairs, allowing you to take pot shots. By the final level, the University Hospital of Mitton, my cockiness was in the bedpan. This hospital was focused on research and gave me tough targets to hit, but it was also in one of the colder regions of Two Point County, so I was more concerned with affording enough radiators to keep everyone happy. Unfortunately, telling everyone to just put on an extra sweater, dad-style, is not an option. Luckily, taking out a series of dubious loans is. The more I see of Two Point Hospital, the more I want to run wild through the medical establishments of Two Point County, throwing down vending machines and staffing wards with tiny nurses. Just like Theme Hospital it finds the perfect balance between daft humor and that dopamine hit that comes with the best simulations, the satisfaction of fine tuning every corridor and doctor's office for maximum efficiency. Where things have changed it's for the better. You can see the evolution everywhere, in the way you can summon different visualisation modes to spot problem areas, in the challenges the varying regions of Two Point County present, and in surprises like those furry little monobrows that can lift the spirits after a visit from the health inspector. It's a strong medicine that—despite a few desperate trawls of Steam after my demo—nothing else comes quite close to matching.